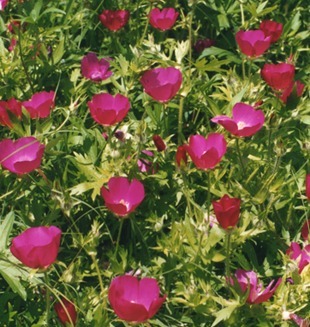 Purple Poppy Mallow is a perennial plant that has a low, creeping growth form and a fragrant flower. Native Americans used the taproot of this species medicinally: a decoction of the roots as a pain killer; the smoke from a smoldering, dried root was inhaled for head colds, and a tea made from the boiled root was drunk for internal pains and also to bathe aching body parts. Native Americans and early European settlers also ate the roots of poppy mallows, which reportedly taste similar to sweet potato when harvested in late summer or fall. The leaves of Purple Poppy Mallow, like other members of the mallow family, are mucilaginous and have been used to thicken soups and other liquids. The scientific name is Callirhoe involucrata. Callirhoe is derived from a Greek work meaning beautiful flowering, and it is a name shared with an ocean nymph in Greek mythology. The species name, involucrata, refers to the whorl of green, leaf-like structures just below the flower which is referred to as an involucre. Bees are common visitors of this species and they are the primary pollinators. Checkered Skipper (Pyrgus communis) caterpillars feed on the poppy mallows. The foliage and roots are quite palatable to many species of plant-eating mammals including deer, rabbits, and groundhogs. Because the leaves are green late into the winter and early int he spring, mammals often seek it out during these periods. Purple Poppy Mallow is very palatable to livestock. It can be used as part of a forage mix on dry sites. It stays green late into the winter and greens up early in the spring, so this species can be a mouthful of quality for livestock especially during that period. Native Americans evidently appreciated the beauty of the flowers of some of the poppy mallow species as do modern landscapers. The foliage is attractive as are the magenta-colored flowers. Because it is indeterminate, it also has a relatively long bloom period compared to other native species. Purple Poppy Mallow readily recruits new plants from seed. Purple Poppy Mallow is found on dry sites such as edges of glades and upland prairies. It often shows up after disturbance events.